He just couldn’t get his glove down quick enough. That is the thought that is going to haunt Texas Rangers ace Yu Darvish quite possibly for the rest of his life. In Houston on Tuesday night, Darvish was working on one of the most dominant pitching performances in major league history. He had retired the first 26 men he faced, striking out 14 of them, and of the 12 men to hit a ball fair, only two made solid contact. It all came down to Astros shortstop Marwin Gonzalez, the ninth-place hitter on what is arguably the worst team in baseball. Gonzalez had struck out and grounded out in his first two at-bats, and Darvish had retired the first two batters in the bottom of the ninth inning on a total of three pitches. Darvish’s first pitch to Gonzalez was a fastball. Gonzalez swung and hit a low liner right back to the mound, but it had just enough speed, and bounced at just the right moment, to get through Darvish’s legs before he could get his glove down. 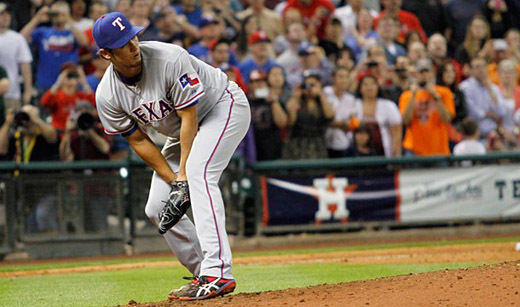 The ball trickled into center for a single, and Darvish’s perfect game was no more. After 8 2/3 innings and 111 pitches, his night was over. With that, Darvish became just the 11th man in major league history to lose a perfect game with two outs in the ninth inning. Here’s a quick look at the first 10.